The philosophy behind the writing of this resource book can be summarized in just a single word - challenge! In every class in school, there are at least three identifiable groups of learners. There are those who fall behind, for reasons well known to themselves; there are those who stay in the mainstream level of thought, not because of their own liking but perhaps due to their inherent resources; and then there are those who lead and want to lead - the leaders of intellectual thought, action and discovery. Not many fall within this group of leaders. It is safe to estimate that almost a fourth of the class, any class for that matter, can be classified into this group of leaders and most probably deep thinkers. This is the group that follows closely and interestedly the teaching that goes on in class, patient about taking notes from the teacher, and admirably serious about quizzes and exams. These students are not wizards or geniuses, just plain common-sensed and diligent young men and women obsessed with the desire to learn more and know more. They like to work on the hard problems...challenge problems. Challenge, for high achievers, promotes excellence. After all, challenge belongs to the few who are tireless, adventurous, inquisitive and curious. They are intellectually capable, they have the spirit of adventure, and they are not shy about where others have not gone before. The problems in this book are especially tough and require much study, review, and rediscovery of related concepts. Also, much progress can be achieved with an inspiring and encouraging teacher who is willing to lead and steer the class in the right directions. Consider, for instance, workingon Hero's Formula. There are some college students who do not even know that there is such a thing as Hero's Formula, and that it is used to determine the area of triangles where only the lengths of the sides are given. A senior, George, and his math tournament team, outscored all other teams in a math competition by solving correctly the area of a triangle using Hero's Formula. Other teams could not use the traditional area formula A = (1/2) bh, as there was no way to find the altitude. 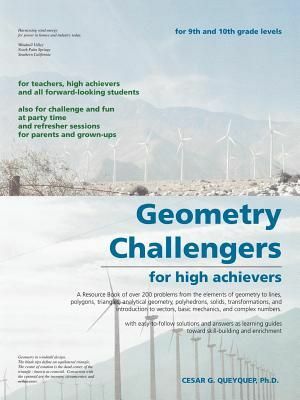 Also included in the book are these other interesting challengers: a) the discovery of pi, b) U.S. 20th President Garfield's Pythagorean Proof, c) the amazing Euler's Line, d) introduction to mechanics and vectors, and e) introduction to complex numbers.